We challenge you to find anything cuter than this Lexy and Bruce "embrace differnces" image created by Alyssa Fendall , of Lissaspiff Fine Arts – Graphics – Design, and Spiffypits Pet Portraits & Illustrations. The image features an adorable likeness of Lexy wearing a shark robe and Bruce donning dog ears. They are 'embracing' thier differences and litterally getting closer to understanding each other by trying on some of what makes them,.. well, them. A perfect representation of how we should approach all things we don't understand; to take time to truly educate ourselves on the experiences of others. 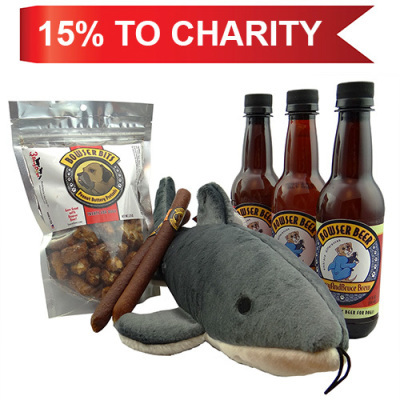 These limited edition TShirts, Tote Bage, Chicken and Beef Dog Treats, and Embrace Differences Party Ale & 'Bruce' Dog Toy Gift Pack - all donate a % of proceeds back to our campaign's charities. Don't miss out on your opportunity to own a little piece of Lexy & Bruce heaven. Till July 31 only! Treat Dreams is a mother daughter team with a passion for dogs and advocating for animal rescue. This dynamic duo love being involved in anything involving dogs: therapy dog work, training, recreational, rescue and canine health and nutrition.They literally live and breathe their passion - designing, shipping, packaging and running all operations for Treat Dreams themselves from their home in Norman, OK. Owner / Operators, Kerri and Kaitlin and thrive on inspiration from their rescue pack that seems to never stop growing! Treat Dreams designed this fabulous short sleeve TShirt available in grey. 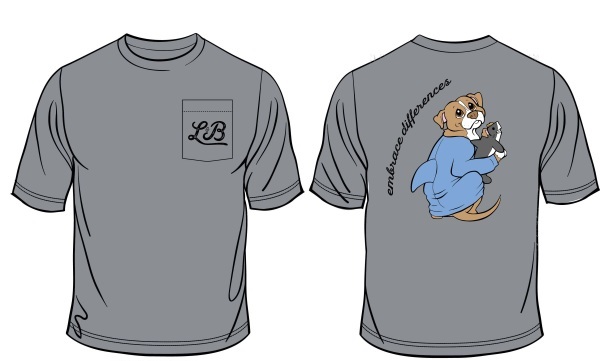 The main design is on the back and features Lexy and Bruces' trade mark "L&B" logo on the front pocket. 100% cotton. Pre-shrunk ringspun. These shirts have that worn in look and feel like you've owned them for years! True to size/baggy fit. 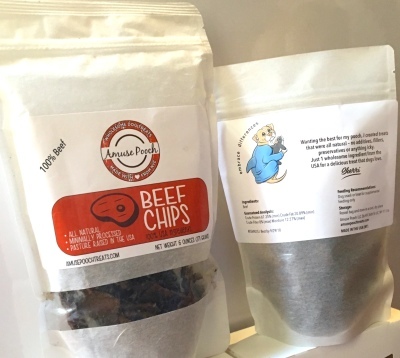 Amuse Pooch Treats, owned and operated by Sherri Davis, is located in New York, USA. After 20 years in the corporate world and traveling almost 2 weeks every month, Sherri made a decision to get her priorities in order. She quit her job to rescue a puppy. The treats on the market did not satisfy her desire for healthy, wholesome, fun & quick eating treats - so she created her own treats that did. A year of interviewing, testing & insuring her treats met every regulation necessary and Amuse Pooch Treats was launched. 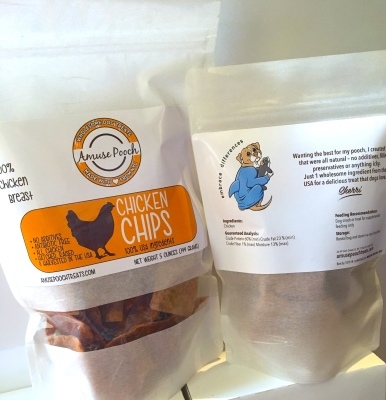 Amuse Pooch Treats are made in a commercial kitchen with USDA Beef or 100% antibiotic free, ethically, pasture raised chicken breast from chickens hatched, raised & farmed in the USA. Their treats are approved by the NY State's Department of Agriculture and we worked with Cornell University's Food Venture Center to insure their safety for the pooches and people. In late 2007 Jenny Brown created some pretzel treats, now known as Bowser Bits, for a Christmas farmers market. After signing up for a pet festival, she was inspired by the idea of a beer and pretzel combination. Jenny recruited her two-legged and four-legged family to develop and test some samples. With the four family dogs eager to help taste test, they developed an initial batch which sold out quickly at the festival. Thus started a journey into researching and developing an all-natural, all-American made product that is healthy and fun for dogs. Starting out just in pet shops, Bowser Beer found its way into beer stores, breweries, restaurants, and other retail stores, proving that it’s more than just a gift idea. From the beginning, Bowser Beer has been committed to using 100% US made, all natural ingredients. Pour Bowser Beer over over kibble to add an extra va-voom to your dogs meal, or freeze it into beer popsicles or pair it with doggie ice cream and watch their dogs enjoy a cool treat. Or simply enjoy sip by glorious sip! Bowser Beer have created this fabulous 'embrace differences' Party Ale and paired it wtih a 'Bruce" dog toy by Fluff and Tuff Dogs Toys for this fun Gift pack.